Location, Location, Location. Looking for a Rural Property that's close to Golden, private and set up for rural living? 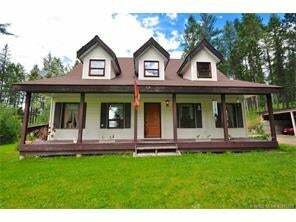 Here is your opportunity to own privacy on 9.45 acres of timbered land with Crown Land Access and less than 7KM from Downtown Golden! Plenty of options for hobby farming, plenty of storage for your toys in the 49' * 28'5 foot pole shed - the options here endless. The entire property is fenced well set up for having livestock. There is a covered, screened deck that's accessible from the kitchen that you'll totally love in the summer while grilling and entertaining with your friends. The Den/Office located on the second floor could easily be turned in a 5th bedroom, making this a five bedroom home. Don't delay in contacting your Realtor® as this is a property that will generate ample interest upon hitting the market.